This evening we are going to talk about and picture in our minds, limestone in its many manifestations here on Cayman Brac. Limestone is the form of calcium carbonate that we’re standing on when we walk the iron shore, walk around Stake Bay, or walk along a bluff footpath. Our island is made of limestone, and it has influenced our lives since people first set foot here and settled. They made houses of “wattle and daub” and the daub was from a form of calcium carbonate, mostly coral heads; and today our biggest private employer is an aggregate company, producing crushed rock mostly for export — another form of calcium carbonate, namely our own bluff limestone. LIMESTONE: Merriam-Webster says it is” a rock that is formed chiefly by accumulation of organic remains (as shells or coral), consists mainly of calcium carbonate, is extensively used in building, and yields lime when burned”. LIMESTONE has shaped our “islands from the sea” — all three of them. We will talk about some of the land forms it has produced, and I’ll ask you to please VISUALIZE each one as I name it. This is an illustrated lecture — but the illustrations are already on file in our minds. If I say iron shore, can you picture it? Snorkeling ashore from the drop-off we pass some CORAL HEADS and other structures of the CORAL REEF. Finally we clamber onto the IRON SHORE, and when we walk around there we meet a few BLOWHOLES. 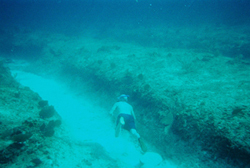 On Cayman Brac we have good ones on the northwest ironshore, and diagonally across on the southeast ironshore. Taking off our flippers and walking inland a little bit, we walk up the BEACH RIDGE made of coral rock washed up during old hurricanes. This ridge, also called the hurricane dune, is locally called “The Rise”. Climbing over the rise and pushing through sea grape and plop nut trees, we walk downhill to “The Fall” — to the ancient BUTTONWOOD SWAMP or wetland. This pattern holds true both for the north side and the south side of Cayman Brac. The dominant tree on very wet iron shore substrate is often buttonwood, mainly green but with a few silver buttonwoods mixed in. Only a few remnants of the buttonwood swamp remain today, the rest having dried up because of our north – south oriented housing lots, streets and roads. On Little Cayman, not so much divided into housing lots, the buttonwood swamp looks much like it did at the time of Columbus. Along the lowland plain or plateau are people’s houses, and as you approach the bluff the land rises very gently and dries out, allowing dozens of additional tree species such as “strawberry” and “cherry”. 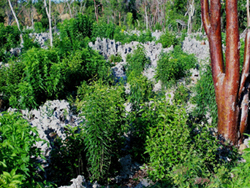 This is ANCIENT IRON SHORE — the lowland fringe of Cayman Brac. Most of the area of Brac is the higher bluff plateau but in the past, the people always built on the lowland plain. I call this plain the “skirt” and there’s a low skirt around both sides of our island. In a way, our island looks like a Chiton or “Sea Beef”, a creature that also has a narrow skirt. As we walk around this lowland housing area we come upon occasional SINKHOLES or WELLS, and in two such wells we have found CAIMAN skeletons! There are also COLLAPSED UNDERGROUND RIVERS and COLLAPSED CAVES here and there on Cayman Brac. Some were once used as “turtle crawls” (corrals). One such is now easily reached by walking along Rabe’s Trail west from our West End Community Park. It’s only a 10 minute walk. To answer your question, a caiman is a crocodilian and such a creature gave us our country’s name. Now and then a skeleton is found, and now and then a relative visits our coasts. OK! Now we come to the bottom of a CLIFF. We call it the BLUFF FACE. The bottom 10 feet is indented by the ancient sea of the Sangamon Era. We call this the WAVE NOTCH and that high sea wasn’t so long ago — only about 50,000 years, which is an instant in geological time. If you want to get a picture of global warming, just stand by the wave notch! The sea is working its way back up to this level. Here and there in the face of the bluff we find CAVES both big and small. They house many creatures, especially when they are properly screened by our beautiful native trees. I can tell you that I am opposed to the clearing of this vegetation, and to its replacement by imported plants such as bougainvillea. This demonstrates no understanding of the role nature plays to screen at least 10 of our native bird species. 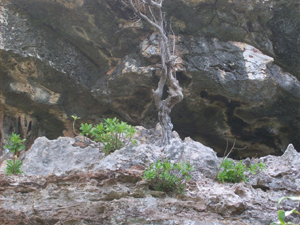 By the way, we have FOUR UNIQUE PLANTS here on Cayman Brac — Brac endemic species found nowhere else in the world. 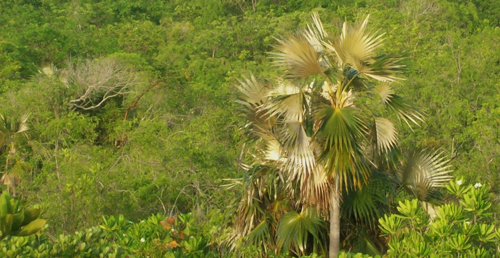 Three grow among natural forest and vegetation on the top of the bluff. One grows ON THE FACE OF THE BLUFF, which is supposed to be the property of the Queen. We must not damage our forests or our natural “screen” of vegetation on the bluff face. If we do, we destroy the Cayman Brac that we know and love. Back to the bluff face, and the CAVES. CAVES are found on the north side, the south side and on top of the bluff. (They are also found underwater, and divers love to explore them.) Entering our caves you may find ROOMS, TUNNELS, BELL CAVERNS (like at Skull Cave), and often STALAGMITES, STALACTITES and other speliotherms. If you manage to crawl 200 feet or so into the tunnels (very dangerous!) You may come upon more rooms, and exceptional speliotherms with names such as popcorn, helictites, flowstone, boxwork, crystals, organ pipes and draperies. For an easily accessible view of some of these structures, I urge you to go into NANI CAVE, recently discovered due to our incessant street building. 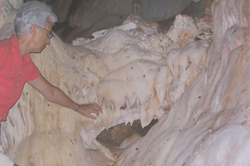 It is the second most impressive cave on Cayman Brac. Wear old clothes, a soft hat (no hard hats please) and take two flashlights. Be careful. Nani Cave is located on top of the bluff, but most of our famous caves are “drilled” into the face of the bluff. Actually, they were drilled OUT by undergroun streams in the ancient days of incessant rain. There are low caves such as Skull Cave, and high ones, good for saving your life in a hurricane, such as Peter Cave. Ancient water trickled and flowed down through the porous limestone, following cracks and softer rock, dissolving the rock, swirling around, eroding the rock with tiny bits of broken rock, and finally working out to the bluff face to crash, in ancient days, on the talus rocks below or even into the sea. In the case of the low caves, the pounding waves of the sea mixed with this rainwater and made a highly erosive force to carve beautiful rooms, some of which give one the warm feeling of being in a womb. Unfortunately the best one, milky white inside, is now covered up by a new road up the bluff near Watering Place and will never be enjoyed again. Perhaps you were called to a meeting to discuss whether or not this should have been done? Oh, perhaps not. Back to the face of the bluff. Let’s climb it like a soldier crab! Those crabs often go into caves, and sometimes have meetings there. Perhaps they trade shells with each other, or engage in other transactions. Almost all of our tree species manages to get a grip on the cliff face, and these provide handholds as we work our way up and OVER THE TOP! I have climbed the bluff face in many parts of the island, and it’s very exciting to enter the bush and dense forest of our remaining undisturbed places. Only 300 acres have been protected for posterity, but we’re working to save more. Perhaps you can assist, because this is the true Cayman Brac, the one that Columbus sailed past. 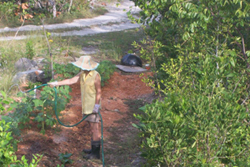 Join the National Trust for the Cayman Islands if you would like to help. On top of the bluff the rocks are PURE HELL to cross. If you’ been to Hell post office on Grand Cayman you’ll know what I mean, or if you try to cross any piece of untouched Brac bluff. This jagged rock will cut your shoes or boots. The rocks are knife-sharp because of something called “differential erosion”. Put it this way: other rocks may wear smooth from rain and other weathering, but our rocks wear jagged! And it’s humpy — first you’re down a hole, then up a car-size rock! I’ve been to places where you could look down into the ground underneath your feet, there were so many big yawning holes! And one place has 60 foot sinkholes so close together, the path between then is narrower than a sidewalk! Has anyone ever explored to the bottom of these sinkholes? NO! Two experienced climbers with lots of equipment looked at them, and went back to rock climbing. No way they were going down there, with or without me. These SINKHOLES are often located on top of the bluff plateau, not far from the bluff edge, and the side of the bluff has many cave openings. Is there a connection between the two? YES, there is! Small cracks in the rock allowed torrential rainwater to fall down into the rock, and out to the edge via small horizontal cracks and tunnels. Broken stones in the water assisted the erosive forces, reaming out the sinkholes and tunnels. The cracks turned into sinkholes by swirling water, and the tunnels sometimes became very large, emerging into large cave openings from which water crashed onto the rocks or sea below. POCKETS OF RED SOIL exist in most of our holes on the bluff plateau. We call it RED MOULD OR MOLD, and it blew here on the jet stream from Africa. During my 17 years living on Cayman Brac there have been many reports by meteorologists of dust storms in the sky, visible from satellites and planes, floating across the Atlantic. We have benefited — that’s how plants got a start, at least most of them. This stuff is found compacted into our native, dolomitic limestone. In some cases it has been compressed into “caymanite”, showing many layers. Calcium carbonate is the main mineral that makes up limestone, though ours also contains a lot of magnesium. In a pure form calcium carbonate is called calcite and can form crystals. That’s what we have here on Cayman Brac. Limestone is “organic” rock — derived from life — rather than inorganic rock such as granite. It’s a soft type of rock, with hardness comparable to a copper penny. It tends to fracture into three acute-angle flat breaks. “Dolomitic limestone” is a very accurate phrase to describe all of our rock here on the Brac, whether it’s low on the ironshore (and modified by salt water), high on the bluff or extracted from the earth by blasting and excavation. Our limestone is highly porous! That’s why it’s light: LIMESTONE IS A LIGHTWEIGHT ROCK because of its porosity, based on its coralline origin. Geologists call it “soft rock” and oil and gas are often found in it. The oil and gas is often distributed among the zillions of pores in the rocks, not as underground pools. Long, long before man there were diatoms. They, and their coral colonial relatives, formed all of the limestone we see today. This means it comes from life — the ancient, igneous earth didn’t have any limestone. Life had to come first. Calcium carbonate is one of the great, mass building materials of the earth. Nowadays the sea often takes away land, reclaiming it into its watery bed. This is called erosion — departing the earth to go back to air or especially into water. But the sea also gives us earth, and in fact the long process is a two-way street. Everything we are situated on today, here on Cayman Brac, came from the sea. Limestone could be called “sea rock” because it was formed in the sea, mostly as coral colonies. The skeletons of these colonial creatures are composed of calcium carbonate. Have you seen the “mantle” of a living seashell, the pretty part that covers the shiny opening or lip? Especially the soft part, like a slippery hand, of a Queen conch? Or the beautiful, spotted part of the small Flamingo Tongue seashell? That slippery organ is busy secreting calcium carbonate to make up the shell! That’s why a small Queen Conch is the size of my fist, while a very old one, perhaps 25 years old, is a very heavy shell indeed — a small child might not be able to lift it! It keeps on secreting its own shell. Since the mantle of the Flamingo Tongue covers ALL of that shell, the whole shell is shiny and smooth, even when we find it dead on the shore. Well, just as the shell’s mantle secretes calcium carbonate to make the hard shell, the tiny coral polyps making up a coral head actually MANUFACTURE that brain coral, or antler coral or other variety of coral, leaving behind hard rock which survives for many centuries. Each polyp is tiny but thousands of millions live as vast colonies, and give us our coral rock. These corals grow to within about six feet of the surface of the sea — at mean or average tide. Often they make a fairly flat bed, mirroring the flat surface of the sea. And that is one reason why our iron shore is flat, and even out bluff plateau is fairly flat except for some erosion (sinkholes, collapsed underground rivers, and upheavals. Calcium carbonate COMES IN MANY FORMS and is found almost everywhere: the “LIME” in your water pipes, or in your kettle, especially if you use well water… WELL WATER ITSELF in limestone areas like ours — it contains dissolved CaCo3 , and that makes our water taste better! Even the water authority filters its pure water through potash to make it taste better. In Canada we call it “hard water” because of the mineral content … CHALK; yes, the white cliffs of Dover in England are made of chalk, and that is Ca Co3…. … “SALT MOUNTAINS” or “Tufa” rock, which occur in many places in the world, but I haven’t found one here so far. . MARBLE is “limestone that is more or less crystallized by metamorphism”. BREAKFAST CEREAL??? Well, read the label on this box of Cheerios! WATER AND CALCIUM CARBONATE have an intimate, two-way relationship. Let’s say you find an old kettle bottom with a deposit of lime on the bottom. Take a clean tin cup and fill it with water. Bring it to a boil. Let the boiling water fall one drop at a time onto a small area of that lime deposit. Some of the lime will dissolve into the hot water now sitting on the bottom of the old pot. The water will look cloudy. Now pour the cloudy water back into the cup, and put the cup in the refrigerator. The result? A new deposit of lime on the bottom of the tin cup! The calcium carbonate has gone from solid to liquid form (dissolved in water) and back to solid form. That is exactly what happens on the bluff, when a stalactite is forming! 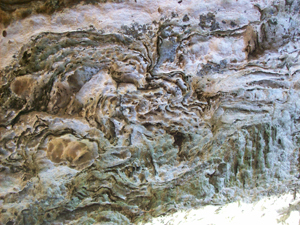 Warm rainwater has fallen through cracks and filtered down through porous rock, dissolving some of the limestone and carrying it in solution. When this mineral-laden water, saturated or even supersaturated with CA CO3, emerges and falls onto cool rocks, some of the calcium carbonate comes out of solution and sticks on the rock. Over the years, this becomes a bump, then a cone, then a stalagmite! The part at the ceiling becomes a stalactite! You can see these forms in Nani Cave. So back and forth it goes — rock to liquid, liquid to rock, the endless cycle of limestone. DO WE LOVE OUR LIMESTONE ISLAND? earthquakes: limestone rock is among the safest to live on if you are in an earthquake prone area such as ours. We have no clay soil. Clay soil becomes mud and mud sloshes around during earthquakes, bringing down buildings. Other rocks snap, split and shatter but our limestone tends to crunch up, reshape, re-form itself and even weld together to some extent with the action of moisture. flooding: lack of flooding here, because no rock is more porous than limestone. Grand Cayman has flooding in areas of “marl” (another version of broken limestone) but we never have flooding on the bluff top, unless man causes it. We don’t even have marl roads! I recall a flooding problem at the font entrance of the Aston Rutty Centre. But in the forest 100 feet away you couldn’t have found enough water to fill a bowl! What had happened? People had trucked in tons of “fill” around the building site! tsunamis: lack of, because our island emerges straight from the sea and is bounded by deep water, most famously the Cayman Trench; there is no continental shelf to allow tsunami-generating waves (from earthquakes) build into tragic height. hurricanes: we have some high ground to build on, and some high caves to hide in! The bluff helps to shelter our lowland areas too. Our forests: remember these words, which describe our forests here on Cayman Brac: “Dry deciduous subtropical limestone forest” That is what we have that the rest of the world might envy. Protect it with your lives, your votes, your influence, your house planning, your membership in the National Trust for the Cayman Islands, your walking club, nature club, biking club, plant club, historical society, even your churches — if you must build yet another one, drop it into the forest, don’t clear-cut the forest! Make a winding path and install bike racks! Install a bicycle parking lot! Get with the program here — it’s good for all of us to save our land and forest. Who wants to live in a shopping mall?